We came back a few days ago from this year’s third and final visit to our island cabin. Like every one before it, the visit was good for the mind and body to just let life’s daily stresses melt away. We didn’t escape the summer heat entirely. Our first couple of days were pretty toasty (90-plus), but after that things settled into a comfortable space and it was even raining lightly as we took our leave on a Saturday morning. A few hours later, we were crawling through Seattle traffic, thanks to some guy in a compact who thought it would be a good idea to cut in front of a tractor-trailer on I-5 … and didn’t quite pull off the maneuver. Welcome back to the mainland, eh? 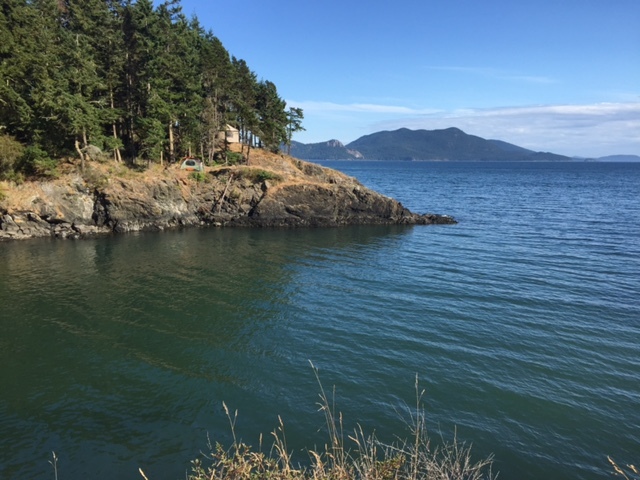 In any case, here are a few images that make me wistful, but which I hope convey what it’s like to be up on Orcas Island, the jewel of the San Juans. 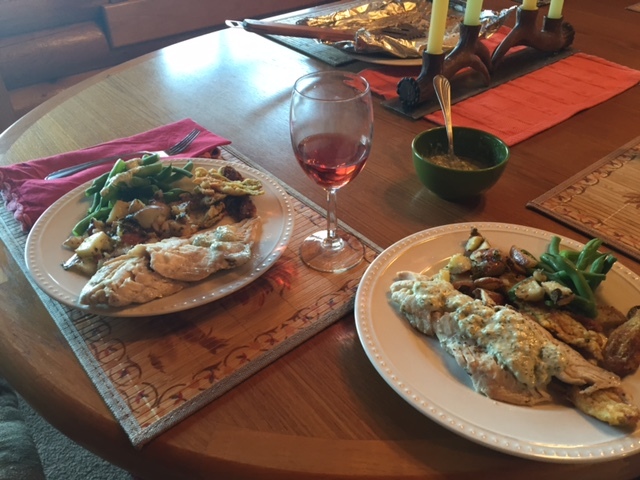 First night’s dinner at our cabin: grilled snapper, roasted red potatoes, green beans from our Portland garden. 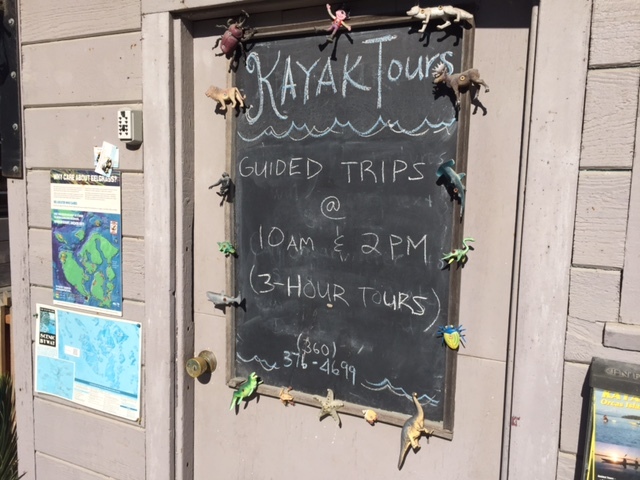 In addition to short hikes with the dogs, board games and books, we kayaked out of Doe Bay. We hit the water under the guidance of Cory, a sea kayaking guide from Iowa City (go figure), and another couple from Portland celebrating their 10th anniversary. Good vibes all around. 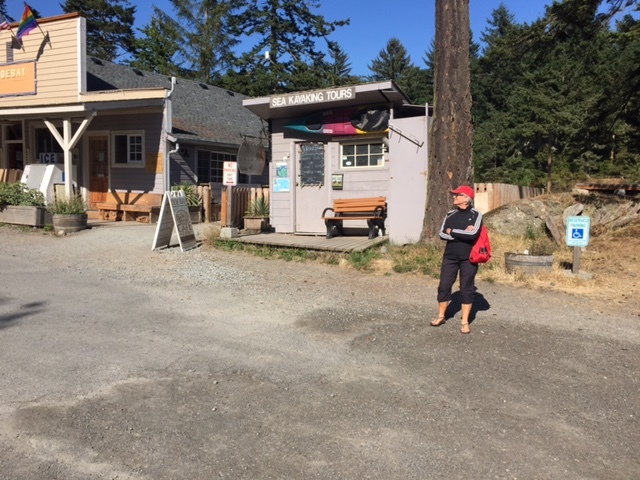 After three hours of sea kayaking, during which we viewed a nesting bald eagle and a mink scampering on the rocks, we looked back out to Doe Bay. 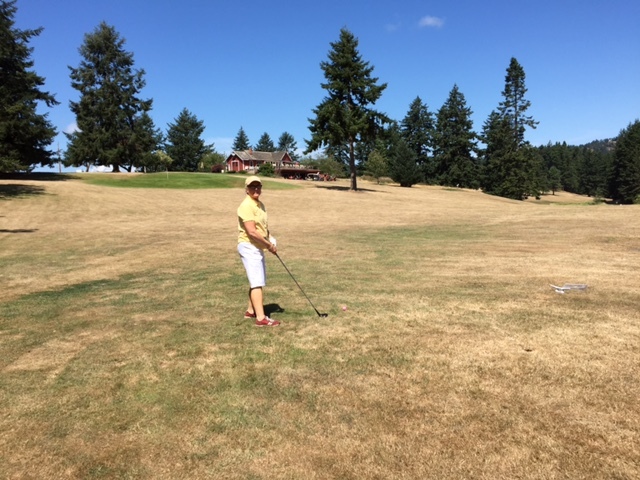 We played a round at Orcas Island Golf Course. Pretty dry but very relaxing. Lori must have been my good-luck charm because I FINALLY broke 50 for 9 holes — 49. Yes! Socializing is hit and miss because you may come up to the island before or after others. 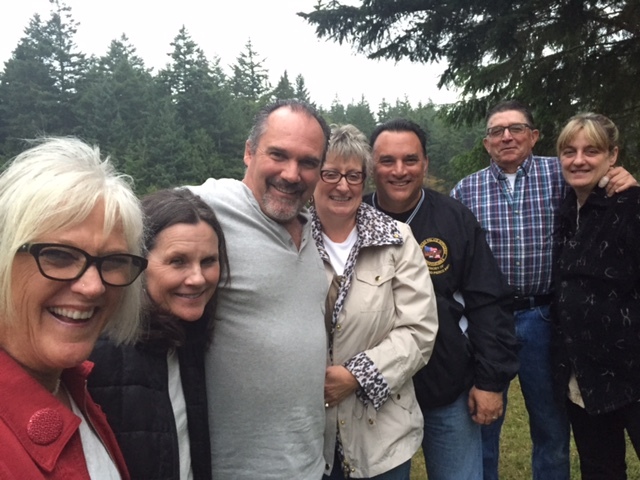 This time we hit it right and enjoyed a paella dinner at Eagle Lake with a group that included a couple of retired California cops and their wives. From left: Lori, Gale, Phil, Lisa, Bob, Carl and Juliana. 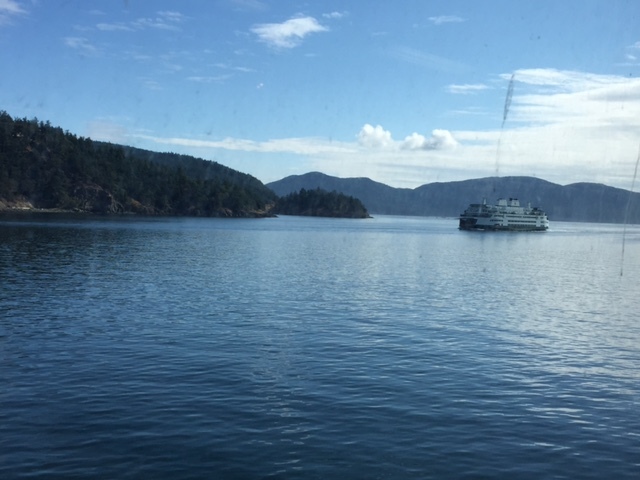 Heading home: A glimpse of Orcas Island from our eastbound ferry. Passing ships. Literally. 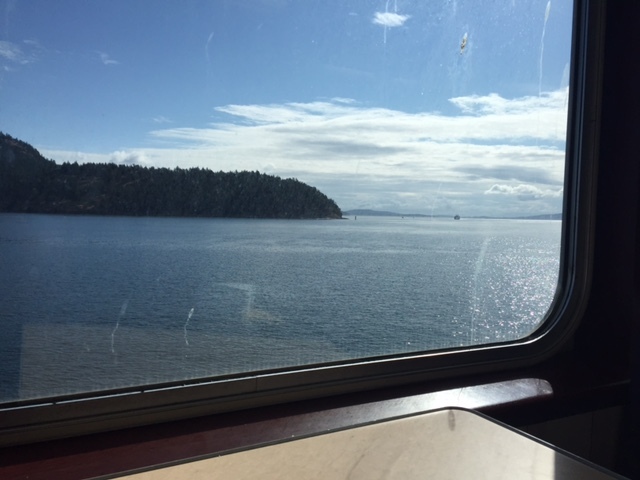 As we glided across the water towards Anacortes, a boatload of passengers headed to Orcas Island. Sue Wilcox and her mother Betty Deneke.. Sitting in Mom’s quiet room feeding her yogurt in small spoonfuls, I listen to her babble between bites; the words are mumbled except for an occasional name. She is thin, frail, unable to hold up her head, so she is supported by pillows. Her eyes open wide with a thought, but she is unable to grab the words. She looks at me in frustration, both wondering why I can’t understand but also trying to figure out who I am. I address her in a soothing soft voice, nodding my head in agreement or telling her it will get done. “It” has no meaning to me; for her “it” is a task she may have left incomplete many years ago. As I listen to her, my own mind wanders. I look at my mother and think of my granddaughter, taking her first wobbly steps, babbling then suddenly blurting a word that I can understand. I can’t help but compare these two females over the last year, one entering the world dependent on all around her, the other, once independent but slowly declining. 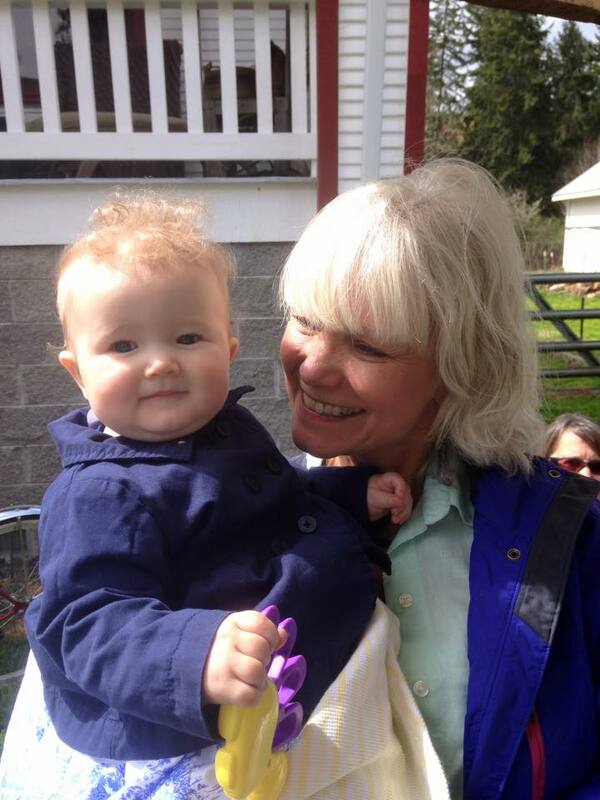 With every advancement my granddaughter makes my mom seems to lose. It’s as though they are trading places and Mom is making room on this earth for this new human. 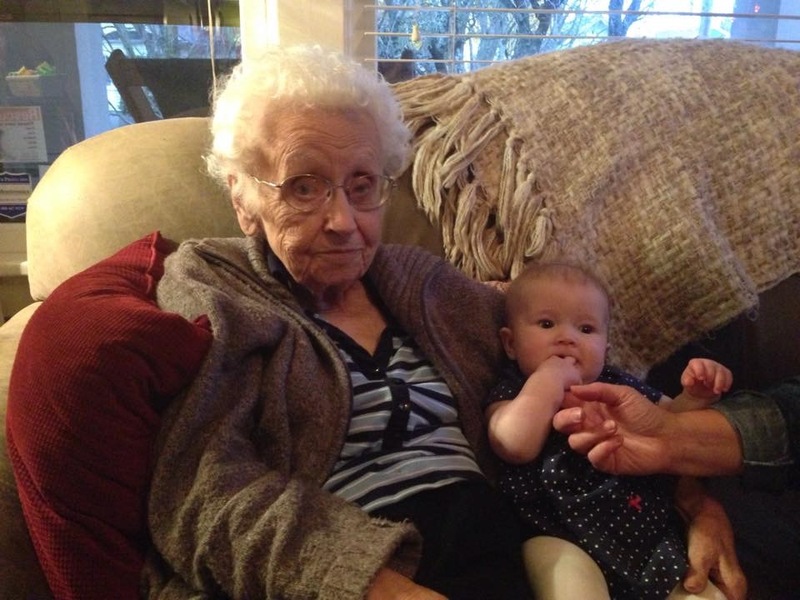 Betty with great-granddaughter Ella at Thanksgiving 2014. Mom passed last night peacefully in her own bed, a Betty Boop doll tucked beside her. She had bounced back these last few days, thinking clearly, smiling, chatting and up out of bed. Then she was gone, leaving us bewildered at her sudden passing. Mom left this world happy and content, having lived a long full life. At 89, she has left that space for her great-granddaughter to flourish and grow, delighting those around her. There will be no more comparisons of these two females, only past memories of Mom and future memories still to be made with my granddaughter. These two females have played an important role in my life, making me the woman that I am and continue to become. It’s hard not to cry as I sit here writing. Being the “middle” of the generational “sandwich” has been a huge part of my life over the last year. Now with Mom gone I am switching roles; no longer am I the middle of the sandwich but the bread. Hopefully like my mother, I too will live a long full life, the top slice for many years as the middle grows and flourishes. Sue Wilcox is a fifth grade teacher at Alameda Elementary in Portland, Oregon. She grew up in Salem and is a true Oregonian. She has lived in the Grant Park neighborhood for the past 27 years where she and her husband Eric raised three fantastic kids. She is sad to no longer have her mother be part of her life but thrilled to focus on this new phase of being a grandmother. Editor’s note: Lori and I had the pleasure of raising our three kids virtually alongside Sue and Eric. With our houses two blocks apart and our youngest children — our Jordan and their Becca — born days apart, our friendship goes back to the days of toddlerhood. 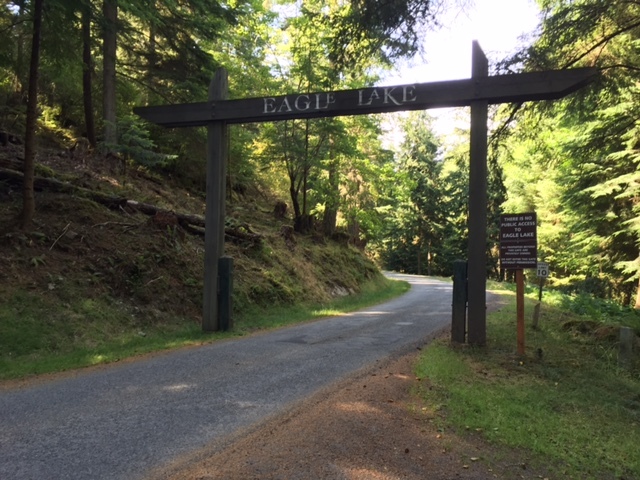 It has only grown stronger as our sons and daughters have grown into likable young men and women with lives all their own..
Where the county road ends, Eagle Lake Drive begins. * This is what you’re supposed to do on vacation, am I right? Any discussion of short stories has to begin with the master, Raymond Carver. But after reading “We Live in Water,” I would argue Jess Walter belongs in that exclusive club of first-rate writers of short fiction. 13 stories, 177 pages, 4 stars. 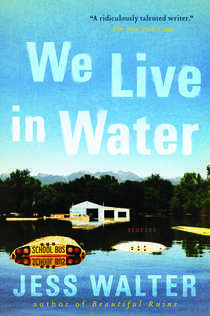 “We Live in Water” is Walter’s first collection of short stories. It was published in 2013 and just waiting for me to pluck it off the shelf of a used bookstore in Anacortes. Totally appropriate to find it and buy it there, considering Walter is a Northwest native who writes authoritatively about Seattle and Portland, even as he continues to reside in his hometown of Spokane. It is superb. Like Carver, Walter excels at quick sketches that bring to life totally believable characters, most of them down-on-their-luck and just trying to get by. Most are blue-collar or unemployed and many of them are trying to mend broken relationships. And all of them, for better or worse, reveal something about their inner selves that allows us to understand them and their behavior and their life choices. 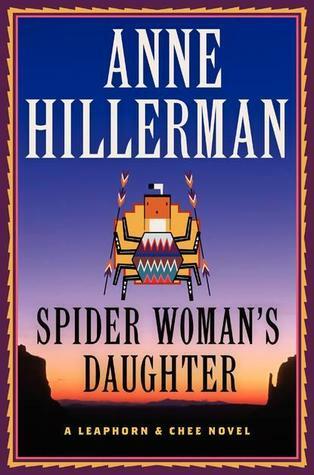 Combine those authentic characters with great plotting, pitch-perfect dialogue and an unerring sense of place, and you have all the elements of a satisfying read. As a Portlander, it’s a bonus to see specific places like Powell’s Books, Coffee People, the Heathman Hotel — even Beaverton — sprinkled throughout the stories. — In “Anything Helps,” a homeless man in Spokane relies on cardboard signs to panhandle while trying to save enough money to buy a book for his son. 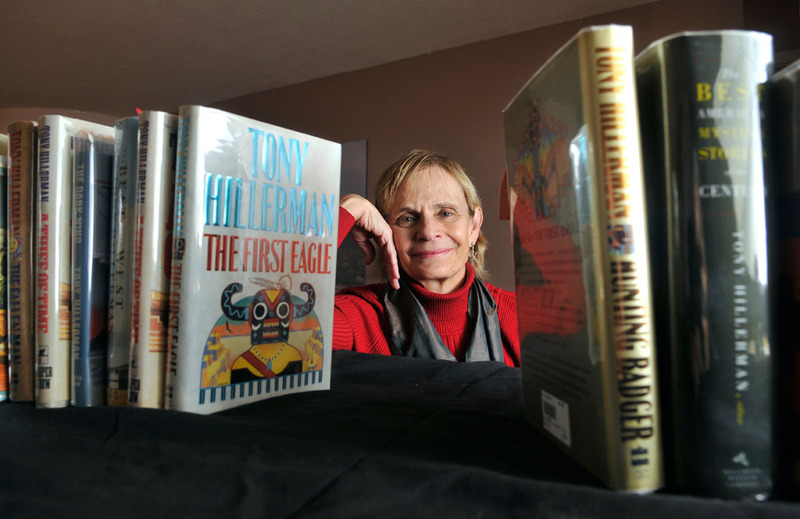 — In the title story, a San Francisco lawyer returns to a small Idaho town hoping to learn more about his father, who disappeared when he was a young boy. — In “Helpless Little Things,” a scam artist who sells dope up and down the I-5 corridor befriends two Portland teenagers in a scheme built around soliciting donations to Greenpeace. — In “The New Frontier,” two high school buddies from Spokane head down to Las Vegas in search one of their sisters, who may have been sucked into prostitution. At the end of a 3-hour grilling class, here was our payoff. A classmate and I prepared Grilled Polenta and Portobello Mushrooms (center foreground) and Pesto Shrimp (two dishes to the right). 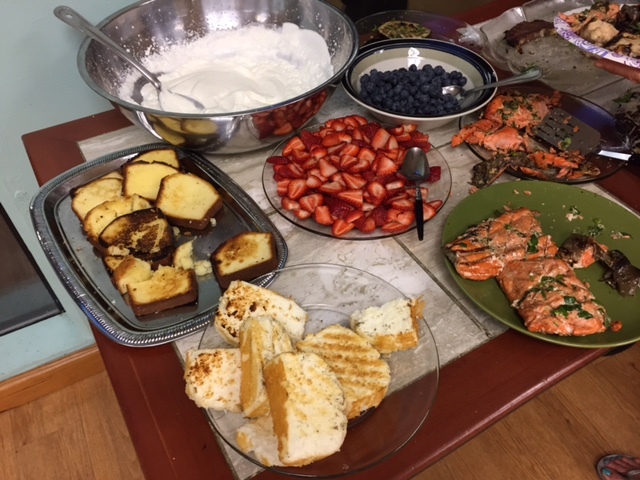 When you’re married to a great cook and your kids knock it out of the park at family dinners and brunches, you know you can’t be the slacker. Maybe that’s what Lori had in mind when she presented me with a gift certificate for a one-night grilling class offered by the local community college. Turns out it was a great Father’s Day present. 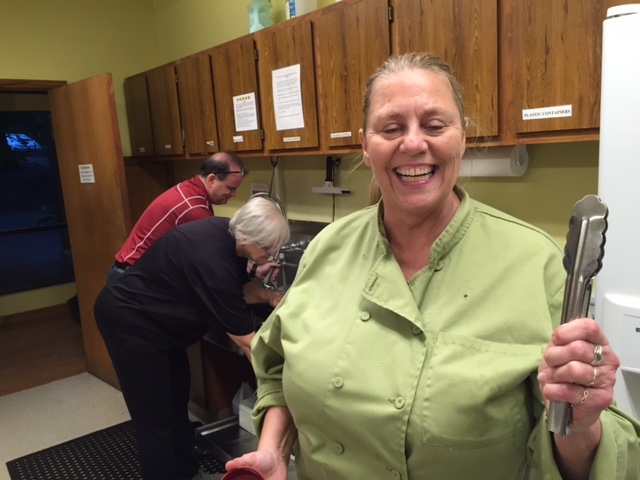 Instructor Robin Brauer was upbeat, encouraging and resourceful. I redeemed the certificate last Thursday, joining a dozen other men and women at a Unitarian church in the westside suburbs. An unlikely location, for sure, but a logical one once I glimpsed the size of the kitchen. 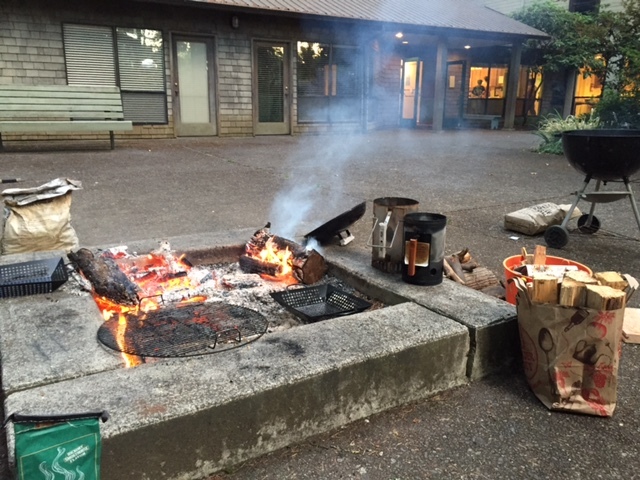 As for the outdoor cooking, the instructor brought two Webers (one large, one small) and there was an open pit in the shaded courtyard big enough to lay down three more grills. It all proved to be just right for our group as we took turns bringing protein and vegetables out to cook. 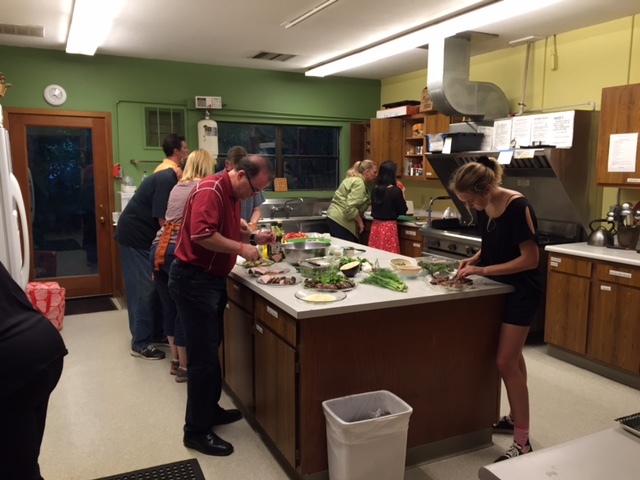 The kitchen at West Hills Unitarian Church in Beaverton was big enough for 13 students and one instructor. The instructor, Robin Brauer, was great. 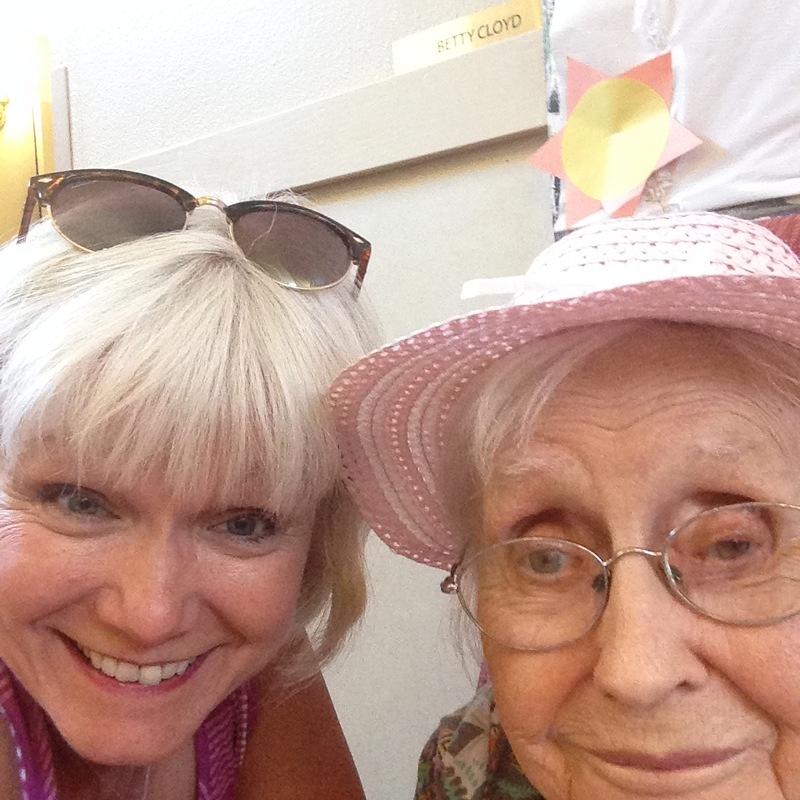 She was informal, encouraging, funny, resourceful and patient. While another teacher might have spent a lot of time lecturing on different techniques, she took a different approach. She assembled packets of a dozen recipes, had us look them over and then pair up according to which dish we wanted to prepare. No better way of learning than doing, she said. No shortage of choices, either, with two salmon dishes, two chicken dishes, a pork loin, a ribeye and a skewered shrimp dish. 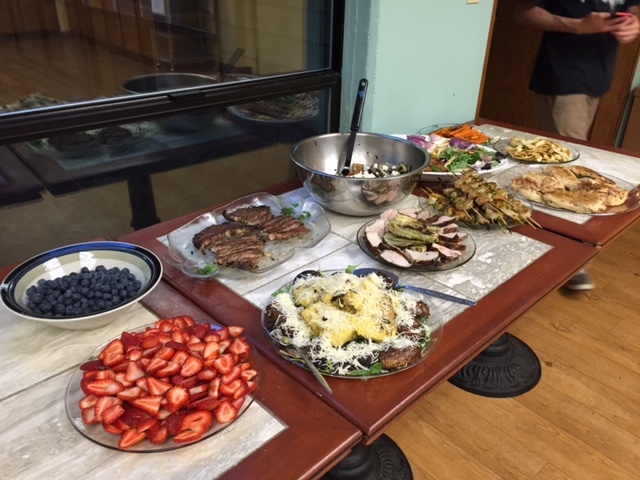 There also were grilled veggies and desserts (peaches, angel food cake). We used a fire pit and two Weber grills to cook in the shade of the church courtyard. My partner was a laidback dude, Joaquin, who’s a graduate student in library science and who told me his parents named him after the San Joaquin Valley in California where they were living for a time. Nope, he’s not Latino. Just an average white guy with a cool name. “Because of Joaquin Phoenix, I don’t have to tell people how to pronounce my name,” he said. “Bet you’re mistaken for him for all the time,” I responded. Joaquin was an excellent partner. Call me biased, but I thought our dish was the best – and possibly the most ambitious to prepare in such a short timeframe: Pesto Shrimp with Grilled Polenta and Portobello Mushrooms. 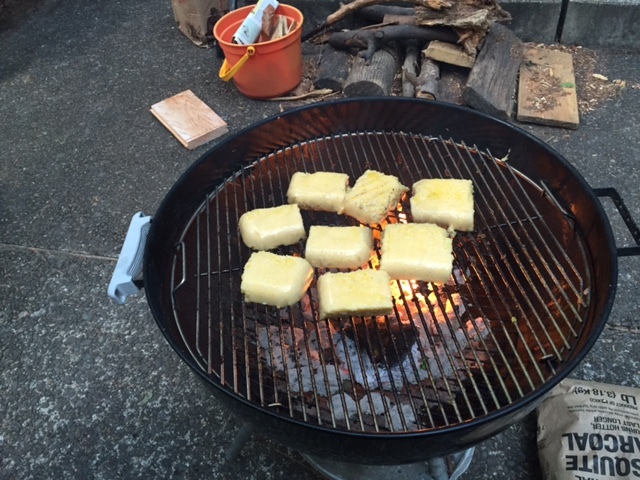 Who knew you could grill polenta? While Joaquin prepared the polenta on the stove top, I put together the marinade for it and the mushrooms. Normally, you’d refrigerate the polenta for hours to let it congeal. We didn’t have that luxury so we threw in the freezer, cut it into eight squares, oiled both sides and grilled it. Did the same to the portobellos. We teamed up on the shrimp, Joaquin skewering those babies and me basting them with a brush. We served everything onto a platter of mixed greens and it…was…fabulous. It was a nice group to be with: two married couples, a father and his teenage daughter, four men and three women. Robin made it easy for us. She brought a dozen plastic bags already stocked with the herbs, spices and oils each dish required, and moved easily from person to person in the kitchen, helping us locate utensils, dispensing advice and answering every question thrown her way. She’s a personal chef making a career transition to nursing, and I suspect she’ll have no problems with her bedside manner. A genuinely nice person, she is. More of a good thing: Fresh berries, whipped cream and grilled cake. Salmon served separately. The three-hour class was supposed to end at 9, but that’s when we sat down with our paper plates and plastic utensils to share in the bounty of what we all prepared. What a buffet of goodness, with Pok Pok-style chicken wings, chili-lime shrimp skewers and grilled veggies with feta – just to name a trio of dishes other than our own. Between bites, we went around the table, sharing our experiences and describing our mini-challenges. Robin offered feedback and answered even more questions. Don’t know what Lori paid for the class, but the $20 per person fee to pay for the food was entirely reasonable. We all pitched in on cleanup (a commercial dishwasher helped save gobs of time and labor), helped Robin pack up her car trunk and went our separate ways into the night. Next time we have a family get-together, I’ll be prepared. Thanks to Robin, I’ve got an assortment of new dishes to spring on people. I only hope our gas grill will deliver the same outcome as the charcoal and wood-fired grills we used in class. This little creature got caught in the netting in our garden. Among all of nature’s living creatures, birds are among my very favorite. Aside from the fact they can fly, many of them are breathtakingly beautiful with their striking red heads, blue or yellow bodies and their wing structures, no matter how big or small. Monday morning gave me a chance to hold two of these creatures under opposite circumstances. The first: Lori looked out the window of our cabin and saw a lifeless form on the ground. It was a goldfinch, a juvenile. I went outside, picked it up and held it in my hand. The body was still warm, the eyes still barely open. It weighed only a few ounces and the feathers were downy soft. Lori speculated that the bird flew into the window. I didn’t hear anything but she’s probably right. I felt sad for our little friend, but also grateful to be able to hold such a delicate being. The second: Less than two hours later, Lori called for me. 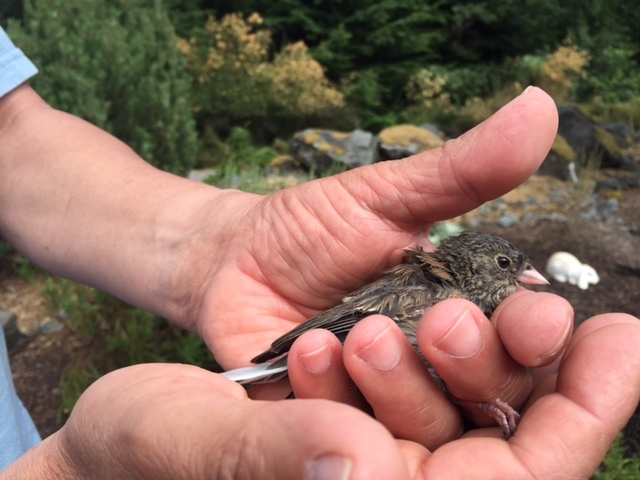 A small bird had got caught in the netting we use to keep deer away from edible plants in the garden. It was a small sparrow. Fortunately, it was stuck toward the bottom of the netting within easy reach. With great care and a pair of scissors to snip carefully at the plastic netting, I was able to calm the bird and eventually free it. She (don’t know why I’m assuming it was female) let me hold her gently and pet her with my index finger before letting her go. My little friend let me hold her after being rescued. She flew from my hand … and directly into the netting again, this time higher off the ground and in a more difficult spot to reach her. The poor thing was upside down, her head caught in the mesh. I reached her and held her steady. Before Lori could return with the scissors, I managed to pull her out and this time stood to the side of the netting before releasing her from my palm. Success. She flew away, maybe 40 yards, into a tree and disappeared. A traumatic morning for her. A bittersweet one for me. Wish I could have saved the goldfinch, but glad to free the sparrow. The third. Not 20 minutes after I wrote this post, I went outside and discovered a second bird had got itself caught in the garden netting, at the exact same spot as the first. Was this a weird coincidence? Or was it the same sparrow that got tangled originally? I’m thinking it was a different bird because I didn’t see any reddish signs of trauma on its body from trying to free itself. I did see something like that on the first bird I rescued. In any case, I was able to free this one in 30 seconds tops. The fourth. Yes, there was a fourth. Today at mid-morning, I came in from outside to hear chirping and fluttering — sounds of distress from the little bird that had flown into our cabin through the open front door. We had left it open for fresh air. Now we had an unintended visitors that was flying back and fourth looking for a place to land. 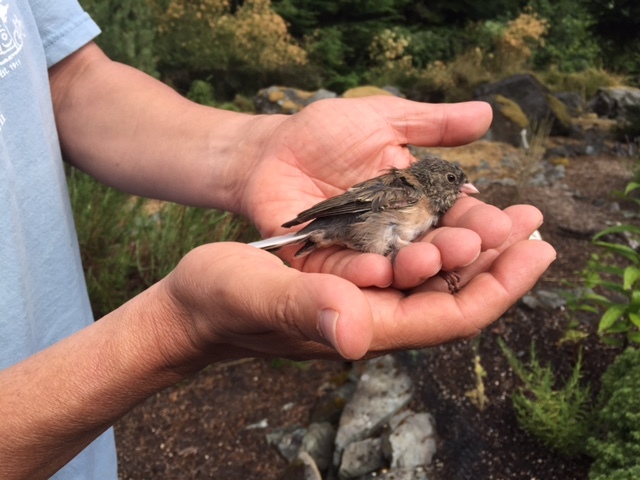 Pine siskins are common on Orcas Island. 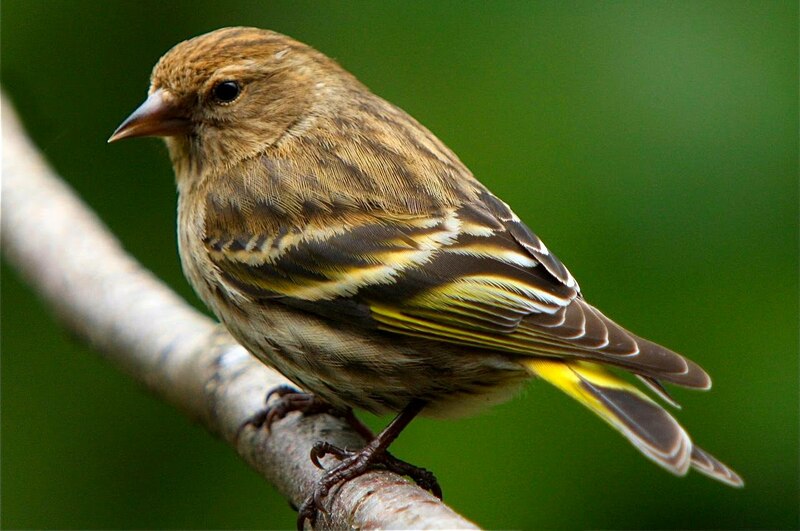 The bird, a pine siskin, was too quick for me to grab with my hands, so I went to the closet and got a fishing net. The bird flew upstairs to where the ceilings are higher and for a minute or two, I chased it back and forth between two rooms. Finally, it settled (sort of) halfway down a wall and I netted it. I carried it down the stairs and to the front door, where I opened my hands. She sat there for just an instant and then flew onto the porch. How uncanny that in the space of less than 24 hours, I would handle four birds. Four creatures that I would normally only admire from a distance. And somehow each of them found a way into my hands. A friend who inhales books the way most of us inhale air recently invited me to borrow any one of his books that he stacked on a kitchen counter. 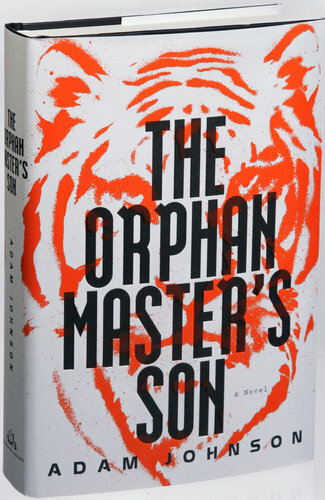 I chose one I hadn’t heard of but probably should have — “The Orphan Master’s Son.” The book was written by Adam Johnson and it won the Pulitzer Prize for Fiction in 2013. A good choice, it turned out. How had I not heard of this writer or this novel? It’s the story of a boy raised in a North Korean orphanage, who as an adult is forced to serve his government as a kidnapper of Japanese citizens and as a signal operator stationed on a fishing boat, then is assigned to be part of a diplomatic mission to the United States. When the mission is judged a failure, he is sent to a prison camp where his identity is either changed or mistaken (we don’t really know) and tortured. Through a murky turn of events, Pak Jun Do takes on the identity of one of the country’s national heroes, Commander Ga, and finds himself designated as a “substitute husband” to Ga’s wife. If it sounds complicated and surrealistic, it’s both. The second half of the novel, in particular, jumps around in time and viewpoints as Johnson introduces another narrator, an interrogator tasked with extracting the truth of Commander Ga’s story. Through it all, the orphan boy has to rely on his wits and instincts — and a high threshold for pain — to survive in the bizarro world created by the late dictator, Kim Jong-Il. As the second husband of Sun Moon, a famous actress groomed by the country’s “Dear Leader,” the orphan boy is thrown into a situation where he faces yet another complication: overcoming the obvious resistance from his “wife” and somehow earning her trust, if not her love. The strength of the novel lies in the imagination of its author. That may seem like an obvious thing to say. Isn’t every novel the product of the author’s imagination? In this case, it’s stunning what Johnson has done. According to The New York Times, Johnson’s research included reading firsthand testimony from defectors and traveling to North Korea himself. The result: He has taken an isolated country ruled by a delusional despot and created characters and dialogue that make this closed society come alive. Through various minor characters and mundane details, we gain a visceral understanding of how stifling life is under a totalitarian regime. It’s not just the radio broadcasts churning out propaganda, it’s the tragically confined existences that most people lead as a result of government-dictated choices and routines. We blanch at the self-imposed limitations of an elderly couple who in the “privacy” of their apartment speak loudly in stilted sentences, even around their adult son, just to be sure anyone listening will be sure to interpret their conversations as unfailingly supportive of the Dear Leader and his regime. Likewise, we understand the predicament faced by a veteran diplomat, who knows his words and actions will be second-guessed upon his return home from a trip to meet with an American politician and his entourage. 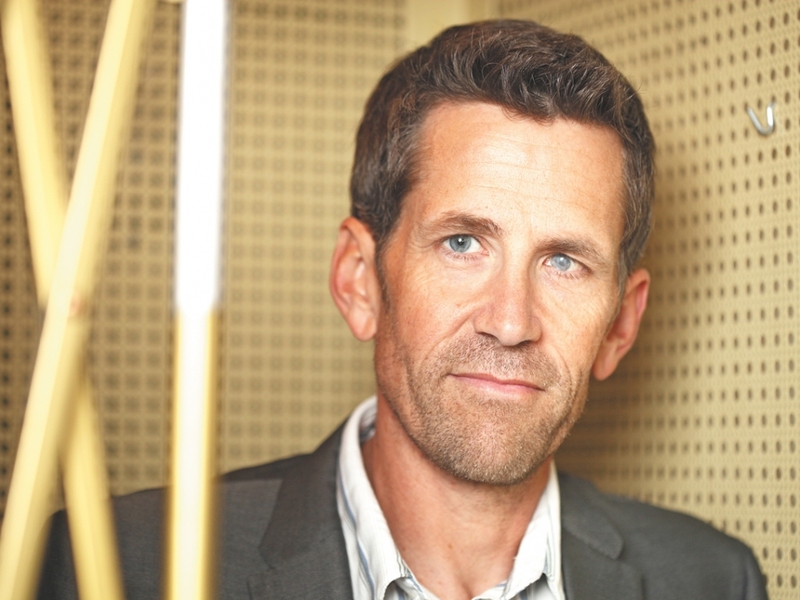 Against this backdrop of repression, Johnson injects a vein of humanity. Jun Do and other minor characters exhibit courage and uncertainty, trust and doubt, compassion and ingenuity. Their challenge — an unfathomable one to those of us who live in a county where our personal freedoms are largely unfettered — is to preserve the human qualities at their very core in the face of a society that dehumanizes them in every possible way. In the case of Jun Do and Sun Moon, their minds must be strong and their resolve unassailable as they plot to escape the hell they’ve been born into. I won’t spoil things and tell whether they succeed. But I will say this novel was a challenge — at times a grind — that grew more compelling the deeper I got into it. Ultimately, it was a satisfying read and one that left me marveling at Johnson’s skills. Troubled relationships and addictions combined to doom Amy Winehouse. 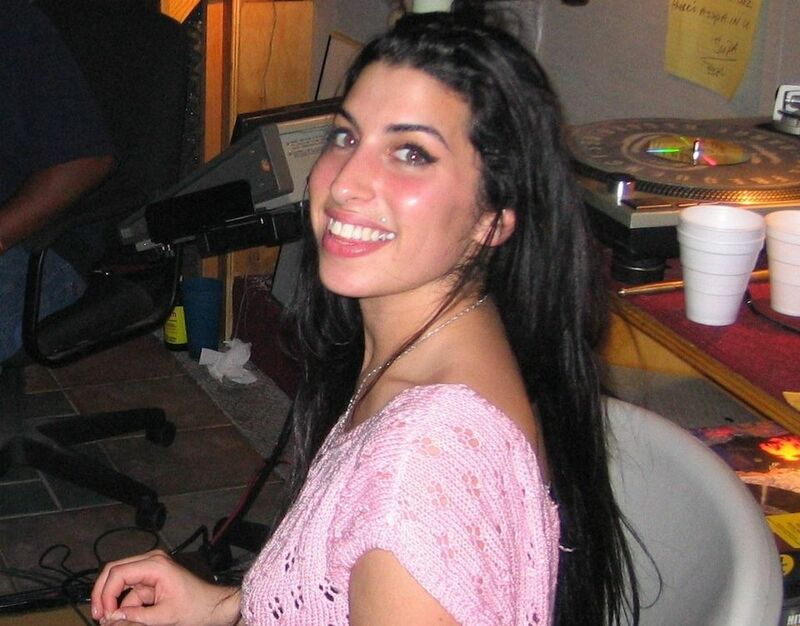 “Amy” opens with a home movie: Amy Winehouse at 14, singing “Happy Birthday” to a friend. She is happy and healthy, and that voice! Rich and soulful, sweet and lowdown, with a wink and a swing. It’s all there, bursting out in full force, ready to change the world, and it did. Winehouse wasn’t ready, though, not for the fame that came with her gift and not for the betrayal of loved ones whose greed destroyed her when she needed them most. She wasn’t strong enough for what life threw at her, and she knew it. Before Amy Winehouse’s death in 2011, I refused to buy her music in fear that I would be a contributor to her eventual fate (I now have nearly every recording). A friend even posted “why do we celebrate a freakin’ drug addict”? Today, after watching the documentary that bears her name, I know now what I knew then: she was brilliant, gifted, lost, funny, sweet, beautiful, dramatic, shy, GENIUS. Amy Winehouse was a shooting star, her prodigious talent streaking across the sky, only to burn up and disintegrate, leaving us to mourn yet another musical superstar gone too soon. At 27, Winehouse died at the same age as Hendrix, Joplin, Morrison and Cobain. Each of them had substance abuse issues. And I imagine each of them succumbed, in part, to the pressures of dealing with stardom. That was certainly the case with Winehouse. 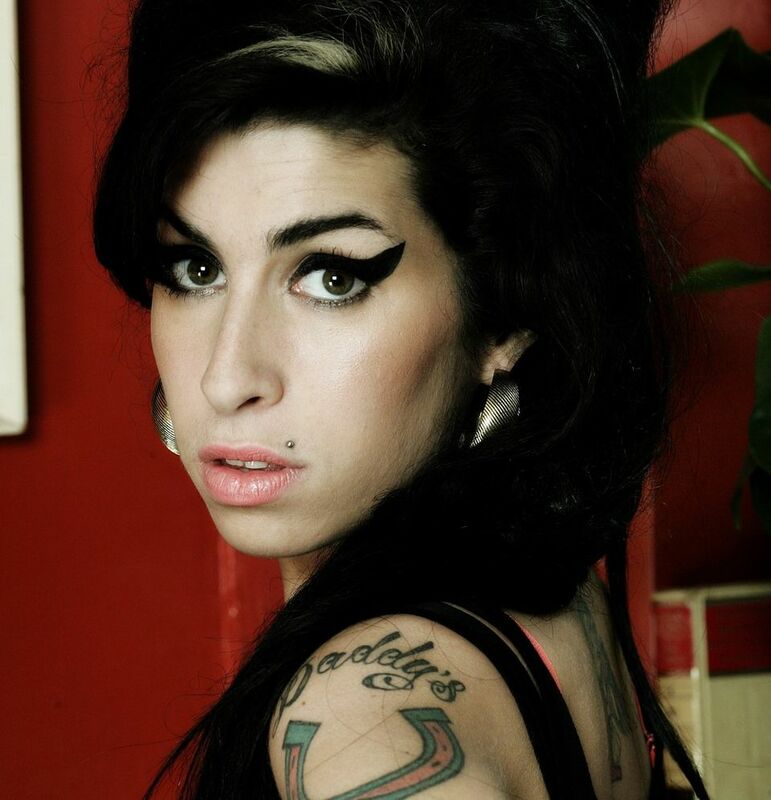 Success brought destruction for Amy Winehouse, who won five Grammys in 2008 and died three years later. In the documentary by Asif Kapadia, we know how the story ends. What we don’t know is how and why Amy went from precocious teenager, a lively Jewish girl from London, to a drug-addled, heavy-drinking young woman. Her talent is easy enough to see. Hearing some of her songs again, whether demos, live club performances or polished studio tracks, made me realize again what a tremendous singer she was. Tony Bennett, one of her idols and someone she would sing a Grammy-winning duet with, said she was born with a spirit for jazz, and compared her to Dinah Washington and Billie Holiday. Less obvious were the forces pulling her down. The people who should have been most protective of her were instead the ones who used their proximity to her to enjoy the fruits of her financial success. And here I’m talking about her ex-husband, her manager and, most despicable, her father. Amy tried to cope but her choices only made things worse. Crack cocaine, heroin, alcohol, bulimia. She was a mess. She tried to get back on track and succeeded for a time. She was clean in 2008 when she won five Grammys, including for Best New Artist, on the strength of her superb album “Back to Black” But she had a relapse and died in 2011 of alcohol poisoning in her London home. Amy was an arresting figure, with her pile of raven hair and ubiquitous tattoos. Underneath that exterior, she was more vulnerable than her fans could ever imagine. She seemed genuinely surprised at her early success, then overwhelmed by it as her popularity soared around the globe. I loved her voice, loved her style. After seeing this film, I have a small window into the pressures that can suffocate a young person who’s unprepared for it. Too much too soon, for sure. 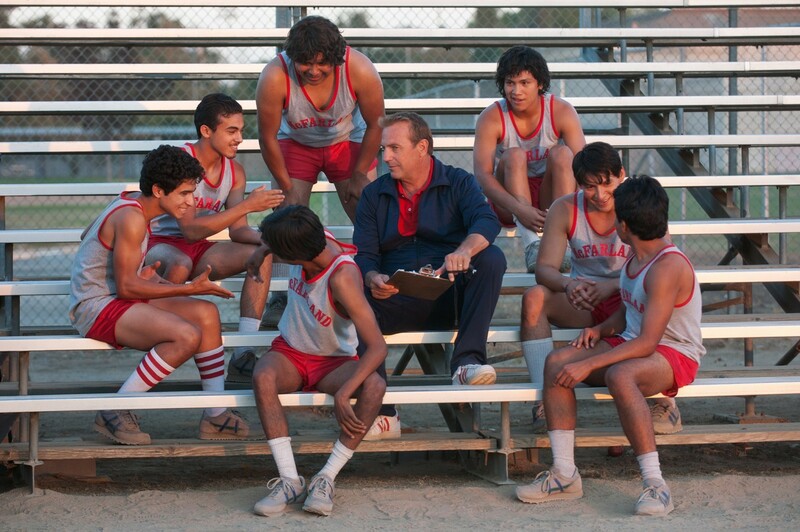 Kevin Costner stars as Coach Jim White in a feel-good movie about a group of California farmworker kids who become state cross country champions. Many years and many pounds ago, I ran cross country for my suburban high school in Northern California. I competed for only two seasons but as a senior I placed 9th at the league championship meet — a distinction that earned me All-League status as a top 10 finisher and helped us win the team championship. We had five of the 10 fastest runners over the 3-mile course — including my best friend, Al Rodriguez — so we easily blew away the competition. Many years and many pounds later, I still run for pleasure but I also remember what it felt like to train for our dual meets and weekend invitational runs against several schools. Hard workouts sprinting up hills. Long runs on residential streets surrounding our campus. Timed laps and interval training on the grassy athletic fields. The movie is based on the real-life accomplishments of a high school cross country coach and his first-ever team of inexperienced, disadvantaged runners in a hot, dusty agricultural community in California’s Central Valley. That’s the region of the state that produces the fruits and vegetables that feed millions upon millions of Americans. The kids at McFarland High School are Latino, the sons of bronze-skinned farmworkers whose work is taken for granted and whose humanity is rarely acknowledged by much of society. 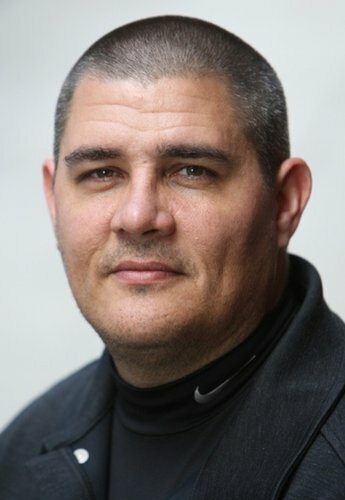 As such, the story is clearly meant to lift up hearts and open minds to what a ragtag collection of runners with tremendous work ethic and extraordinary talent can do when given an opportunity and when coached by someone who believes in them. It’s not a documentary but a Disney movie starring Kevin Costner in the role of Coach Jim White, a guy who’s given a career-saving second chance after losing his temper and his job at a small Idaho high school. (It didn’t really happen that way, but just about every movie based on a true event takes liberties for the sake of the story.) White is presented as a fish out of water — a clueless gringo thrust into a Mexican American culture that’s as alien to him and his family as if they’d landed on Jupiter. Scene after scene shows the young athletes running endlessly in and around the fields and orchards near the town as they build their endurance and speed. Meanwhile, their coach slowly wins acceptance and trust among team members and the community at large. As a third-generation Mexican American, it’s heartening to see people on the screen who look like me and my extended family. The scenes depicting Mexican culture and family values resonate, for sure, even if they come across as stereotypical in some ways. Must Mexican American culture always be defined by low-riders and quinceañeras? It would be a stretch to say the film exactly duplicated my teenage experience. Al and I and my other Latino teammates (only two that I can recall) were a minority on our high school team. And, yes, we had an Anglo coach. But we practiced in a safe bedroom community 40 miles southeast of San Francisco. We weren’t running past tractors and irrigation pipe in 100-degree weather. About 90 percent of McFarland’s 12,000-plus residents are Latino. 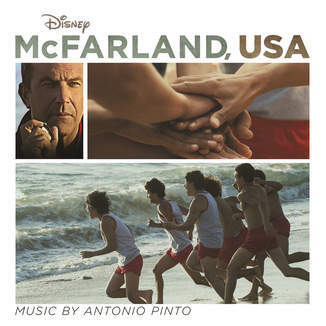 The kids in McFarland came from low-income backgrounds. They and their families constituted the vast majority of the town’s residents. My parents were farmworkers, too, but by the time my sisters and I were born, they had moved away from their families in the Salinas Valley and relocated to the Bay Area. We grew up in blue-collar neighborhoods and Dad worked at the pipe foundry as a millwright. Still, it’s rare to see Latinos of any type portrayed in a positive light in movies or on TV. I appreciate that the Disney studio decided to make this film and I do hope it continues to reach a broad audience. 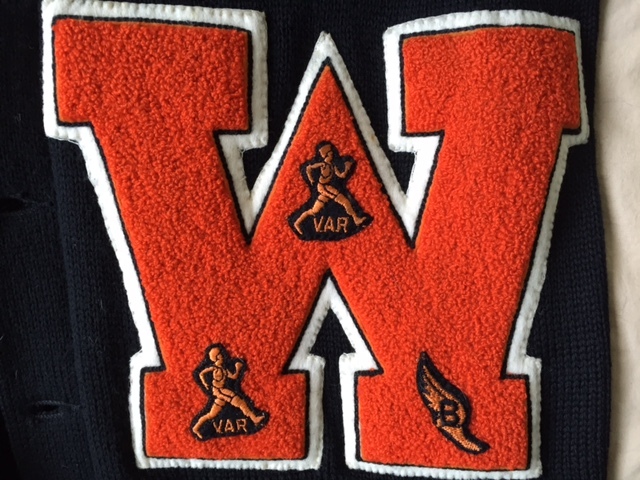 Two varsity letters for cross country at Washington High School in Fremont, California. Final thoughts: The film covers a single school year in the life of Coach White and his team. What’s truly amazing is that he built a dynasty there in that little town of McFarland, winning multiple state championships on the efforts of Latino farm kids. What’s most gratifying is seeing how things turned out for members of his inaugural team. Before the final credits roll onto the screen, we get then-and-now updates on each runner. And that’s the part — more than the running — that made my eyes mist.